Jaylen Adams has been balling all his life, though much of the basketball world only took notice this past March. The Baltimore native and Mount St. Joseph High School legend led St. Bonaventure to the NCAA Tournament for the first time in six years, punctuating a 26-8 season with a stirring win over UCLA in the First Four in Dayton. The contrast between the tiny Catholic school from upstate New York with an enrollment of 1,660 and college basketball’s biggest Goliath, with its 11 national titles and near 45,000 students, was jarring. It was that–much more than the talent on the two rosters, that made the Bonnies’ 65-58 triumph so marvelous. It was March Madness at its best. Adams struggled mightily in that game (just 8 points on 2-of-16 shooting), but his teammates, like Courtney Stockard (26 points, 4 rebounds, 4 steals) helped the Bonnies pull out one of the biggest wins in school history. Still, there’s no denying that St. Bonaventure wouldn’t have been in that position without the co-Atlantic 10 Player of the Year. Adams won the award after averaging 19.1 points and 5.2 assists per game last season. He was also the best Ja(y)len Adams in the country, outplaying his younger, more highly-recruited namesake, Jalen, who’s now heading into his senior year at UConn. That’s gotta be a rivalry, right? 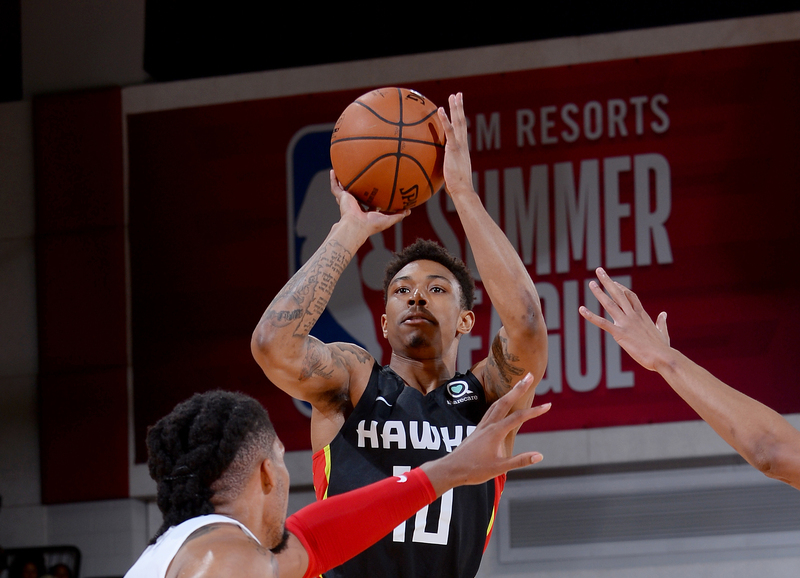 Baltimore’s Jaylen Adams is still an underdog, still balling, and now trying to earn a job playing for the Atlanta Hawks in Summer League. Adams is playing well so far– averaging 11 points in 19 minutes per game for the Summer Hawks. He broke out on Tuesday–pouring in 23 points on 8-of-12 shooting and 5-of-7 from three-point range. Adams is small (6-2), and will have to shoot the lights out and prove himself defensively if he wants to have a chance to stick in the league. He accomplished that on Tuesday. Though his shot is slightly awkward, and he might not have elite size, speed, height or defensive ability, Adams will make a career professionally because he can put the ball in the hole–which is, at the end of the day, the name of the game. He’s also a terrific competitor, and you can count on him to get after it every time out.